“The first tuning equipment supplier”. Of all the tuning firms that were tuning minis to a high standard in the 60's one of the most respected and indeed venerable was V.W. 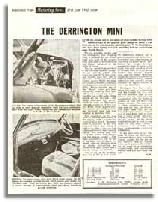 Derrington Ltd.
Derrington proudly claimed to have been selling performance enhancing modifications since 1919, and pronounced themselves as the first tuning equipment supplier! A claim I can neither deny or confirm. They were however, very well established by the 1960's and undoubtedly knew their stuff. 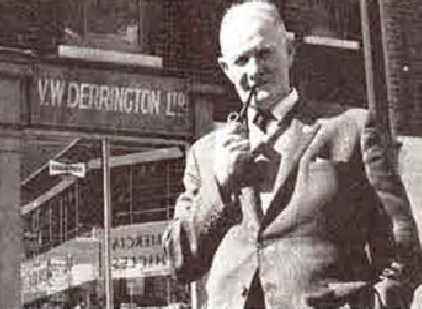 Amongst other things Derrington were the official UK agent for Weber Carburetors, if you wanted a Weber in the 60's it came through Derrington. Below, you will find a review of the company, first published in "Autocar" in their fantastic "That something extra series" as well as a couple of contemporary reviews and extracts form their catalogue. 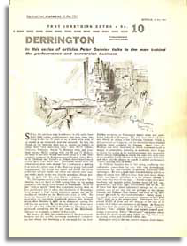 Over the years I have managed to find a few articles manufactured for Derrington’s and have always found them to be of the highest quality. 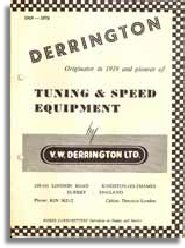 For lots more info on Derrington, I suggest you visit the VW Derrington facebook page. 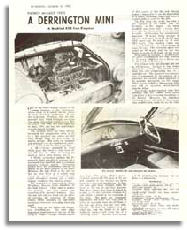 Another episode of the excellent series “That something Extra” from Autosport 1964. 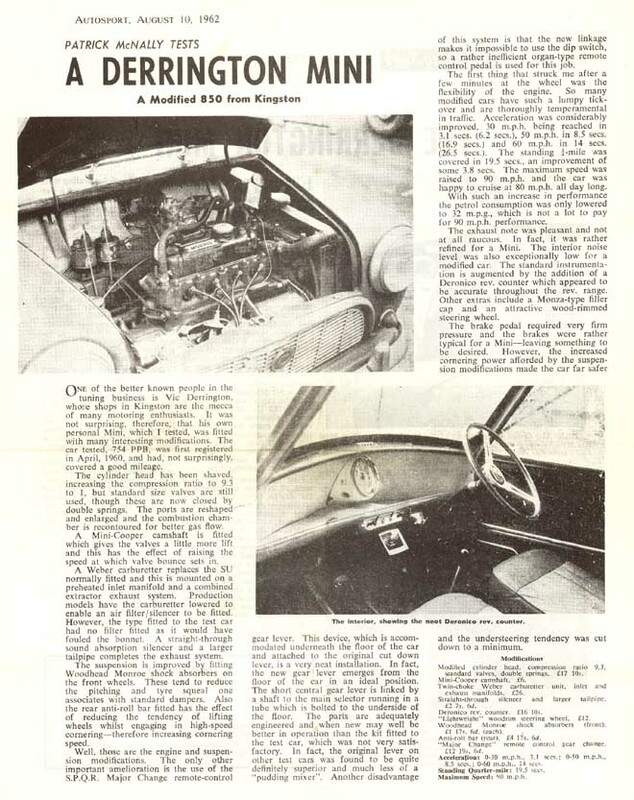 This superb series is one of the best reports on tuning companies from the 1960’s. 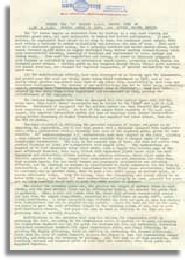 This is a very early 4 page "Tuning Guide" referring specifically to the A series engine, although it pre dates many other similar guides its good to see that the basic ideas never change. Surprisingly comprehensive for a simple 4 page document it still makes an interesting read. 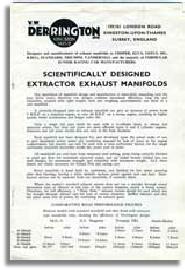 A very nice catalogue dating from the late 1950's, it has an emphasis on the exhaust manifolding offered by Derringtons but also includes many other interesting items including the "LANDAR" rocker cover and "Raydyot" racing mirrors, amongst many other interesting items. 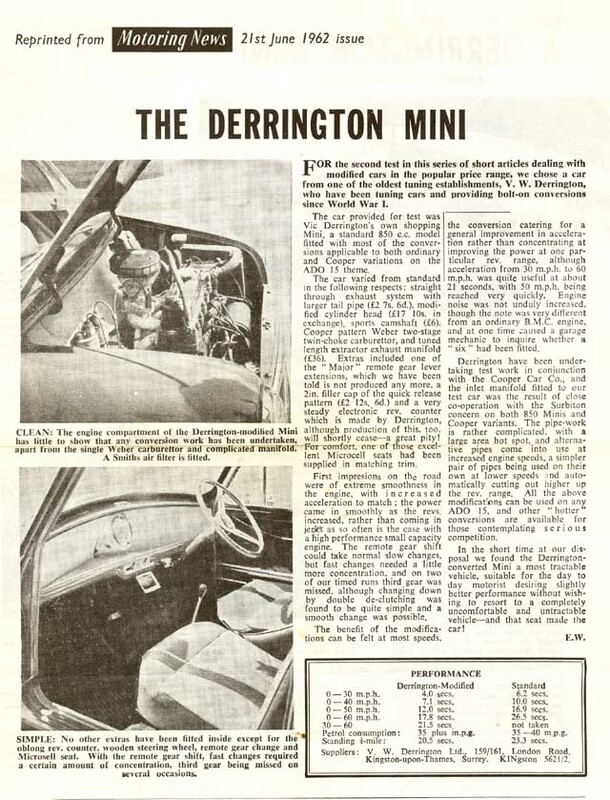 Download a complete PDF copy of the Derrington brochure for A series engined cars. Packed with loads of interesting info as well as price lists & illustrations. Another version of the flier produced exclusively for A series cars with an emphasis on the transverse models. The Cooper & S in particular. I suspect this version is from the mid 1960's. 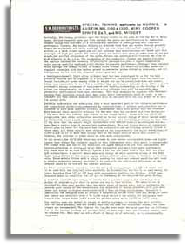 This is a comprehensive catalogue from the mid 60’s containing tuning kits, information & accessories including wheels, steering wheels, instruments etc.